SEMA safety is the safety standard for the storage equipment industry. SEMA stands for the Storage Equipment Manufacturer’s Association, and this self-appointed title is hard-earned. If something is safe according to SEMA, it should be considered safe by everyone using any kind of storage system. Here are some of the key tenants of SEMA safety. Codes of Practice are the backbone of SEMA safety. In these documents, SEMA codifies the laws of safety as it sees them and some of the documents have even helped to influence both British and European legislation. Of course, these Codes of Practice aren’t always the law. As such, the best place to start for a guide on safety is HSE’s HSG76. This guide also isn’t the law, but it’s a best practice guide from the British government and following it is usually enough to stay within the law. For certain specific issues, the HSE guide will direct to relevant parts of the SEMA Code of Practice. One such Code of Practice which influenced European and British legislation is SEMA’s stance on load notices. 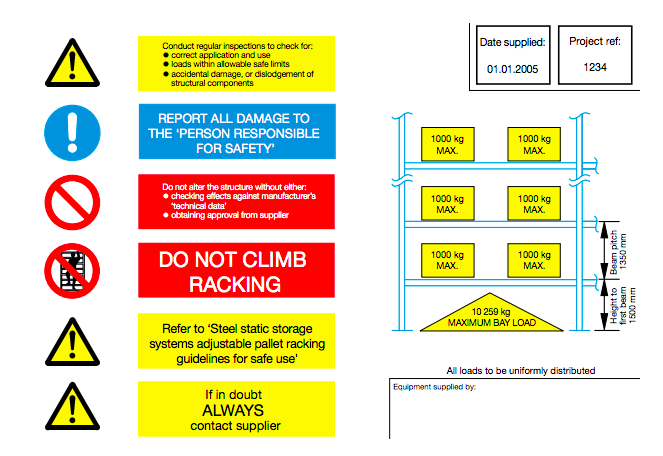 A big part of SEMA’s influence on storage equipment safety the world over are these load notices which the organisation has been developing since the 1980s. Paying close attention to them is a key part of SEMA safety. Load notices usually look something like this. On the left-hand side, warnings are issued in yellow, instructed actions are issued in blue, and prohibited actions are issued in red. This colour coding system falls in line with the EU Directive on safety signs and the corresponding British law on safety signs. On the right-hand side, the top right-hand corner contains information about the date the system was supplied and the product reference number. Below that, a pictogram of a storage system indicates the maximum storage capacity for the system. Note that this storage capacity will be different for different systems. Below all this on the right-hand side, the supplier is listed. 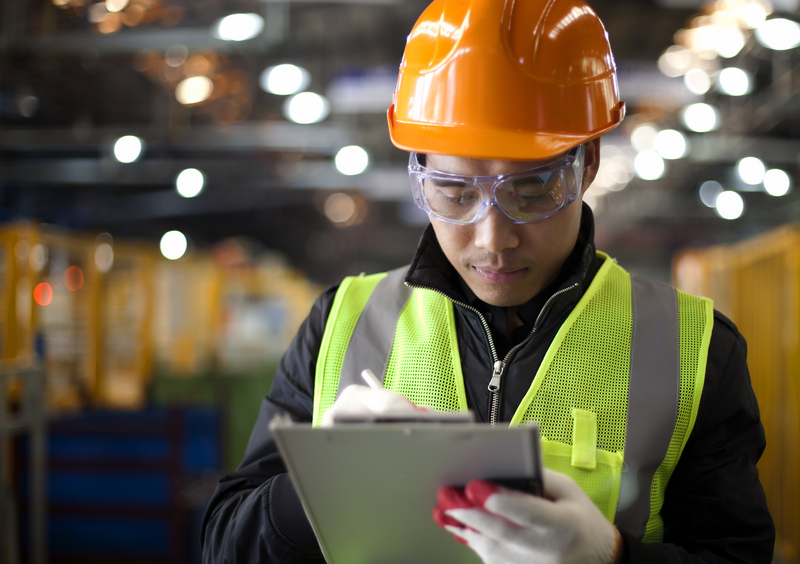 Checking a load notice is not designed to replace racking inspection training or other safety protocol. Rather, it acts as a handy reminder of some the most important aspects of storage equipment safety. As a standard maker for the whole industry, there is a list of SEMA approved racking suppliers and SEMA approved installers or installation companies. These three kinds of approval can be checked with a variety of badges and cards. Firstly, there are SEMA Distributor Companies (SDCs). These are companies which produce and supply storage equipment systems and have been approved by SEMA to do so. SDCs are part of the SEMA Distributor Group (SDG). As part of the SDG, SDCs have to maintain the highest possible standards in the storage equipment industry in order to call themselves SDCs. Secondly, there are SEMA Approved Installation Companies (SAICs). These are companies which have been approved by SEMA to install storage systems. Just likes SDCs, SAICs have to maintain the highest possible standards in the storage equipment industry in order to call themselves SAICs. Finally, there are members of the Storage Equipment Installers Registration Scheme (SEIRS). These are individuals — rather than companies — who have been approved by SEMA to install storage systems. The same usual high standards are required for members of the SEIRS to remain members. In summary, in order for end users of racking systems to properly adhere to SEMA safety, they should buy all their storage equipment from SDCs and make sure it is installed by a SAIC or a member of the SEIRS. However, in order to really follow SEMA safety, the most important acronym for end users is SEMA Approved Racking Inspectors (SARIs). Both SEMA and HSE recommend that end users book a visit from a SARI at least once every 12 months. SARIs can also perform racking inspection training for your staff so that they are competent, as recommended by the CDM Regulations 2015. What’s more, racking inspection training also helps your staff to perform the regular staff-led racking inspections which HSE recommends. SARIs have to pass pre-course qualifier, complete a rigorous and intense training course, attend multiple seminars on SEMA safety, and receive continuous assessment in order to become a SARI and to remain a SARI. As with all other SEMA approved schemes, though, the aim of this rigorousness is the upkeep of the highest possible safety standards. Follow SEMA safety with a visit from a SARI today. Contact Storage Equipment Experts for nationwide coverage of the UK and Ireland!